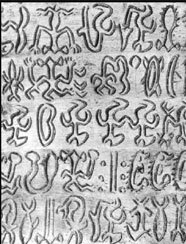 Rongorongo is a system of glyphs discovered in the 19th century on Easter Island. They have yet to be deciphered despite numerous attempts. Although some calendrical and possibly genealogical information has been identified, not even these glyphs can be read. If rongorongo does prove to be writing, it could be one of only three or four known independent inventions of writing in human history. Twenty-one wooden tablets bearing rongorongo inscriptions, some heavily weathered, burned, or otherwise damaged, were collected in the late 19th century and are now scattered in museums and private collections. None remain on Easter Island. The tablets were made from irregular pieces of wood, sometimes driftwood, but include a chieftain's staff, a bird-man statuette, and two reimiro ornaments (decorative crescent-shaped pectoral ornaments). There are also a few petroglyphs which may include short rongorongo inscriptions. Oral history suggests that only a small elite was ever literate and that the tablets were sacred. It is thought that Rongorongo texts are written in alternating directions, a system called reverse boustrophedon. This is known from oral tradition, and also because long copied portions wrap in a way that suggests that reading order. In the case of the tablets these lines are often inscribed in shallow fluting carved into the wood. The glyphs have a characteristic outline appearance and include human, animal, plant, artifact and geometric forms. Researchers believe that these tablets were engraved by utilizing obsidian, shark teeth, and fish bones.